24 7 News Net - Haiti Earth Quake Video ERASED by Youtube. The PENTAGRAM OF BLOOD and LINE OF SOLLOG strikes again. Haiti Earthquake Video ERASED by Youtube. Was Haiti Earthquake from HAARP or UFOS? Over 100,000 are estimated to be DEAD from the GREAT HAITI EARTHQUAKE. 13 days before the Haiti Earthquake struck, the fact Haiti is near a MAJOR POINT in the now infamous PENTAGRAM OF BLOOD was put on Youtube in a trailer for a new film from Adoni Films titled PENTAGRAM OF BLOOD. Now the PENTAGRAM OF BLOOD has been 100% validated by the historic death toll hitting where the PENTAGRAM OF BLOOD predicted a future tragedy. Now YOUTUBE is erasing videos about THE PENTAGRAM OF BLOOD and how the infamous SOLLOG predicted the Great Haiti Earthquake. We've been writing about SOLLOG's quake warnings for over a decade. He has warned in some how HISTORIC QUAKES will strike on dates with 113 in them like January 13th. Sure enough the Great Haiti Quake struck when much of the world was already January 13th, even though Haiti was late in the day on January 12th. So that's just ONE OF THE HITS for Sollog. The third connection is Sollog has been writing about THE PENTAGRAM OF BLOOD for several years, again there's man thousands of pages about it and a song about it and now a movie about it. The pentagram connects so many EVIL EVENTS to it since the death of JFK in the USA, that many who see it are convinced THE EVIL ACTS THE PAST 45 plus years in the USA are not 'random' events, the PENTAGRAM OF BLOOD proves these events are PLANNED. Who planned it? Is it SATAN? Is it UFOS is the NWO and US government? All we know is THE LINE OF SOLLOG and the PENTAGRAM OF BLOOD are things Sollog has warned of and he has repeatedly warned of 113 and HISTORIC QUAKES. Skeptics can't deal with the reality, EVERY HISTORIC EVIL EVENT IN THE USA since the death of JFK is on THE PENTAGRAM OF BLOOD and so is the Great Haiti Quake. Waco, Killeen Massacre, Fort Hood Massacre, Columbine Massacre, VA Tech Massacre and many other school shootings. 911, the Oklahoma City bombing, Hurricanes Andrew and Katrina and now The Great Haiti Quake. Other great quakes that took many lives are on the PENTAGRAM OF BLOOD. Mexico City is another anchor point in the PENTAGRAM OF BLOOD. Near the Pyramid of the Sun. That pyramid is perfectly aligned to the little area in North Canada with a strange ancient Egyptian name, NAUJAAT. It means EVIL in ancient egyptian. 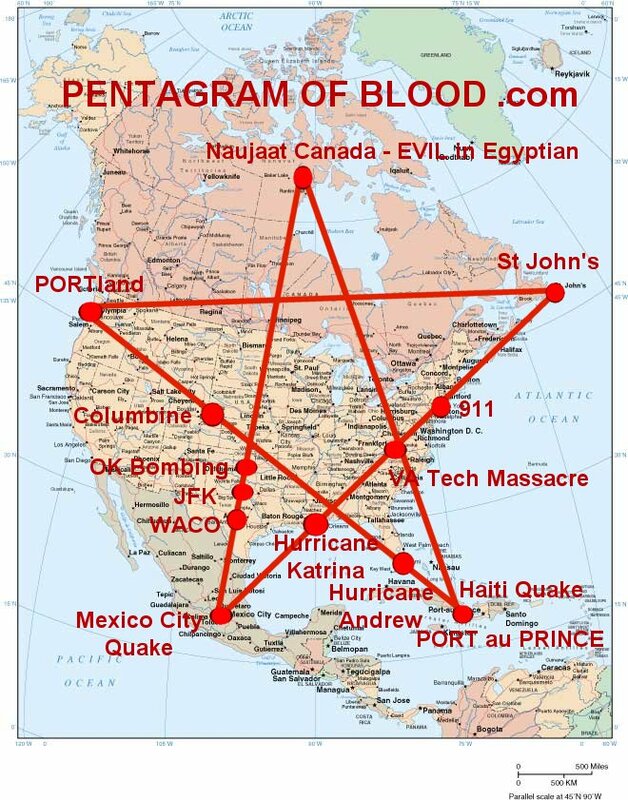 Port Au Prince and Portland are two more POINTS on the PENTAGRAM OF BLOOD. ST JOHNS in Canada completes the PENTAGRAM OF BLOOD. Some say NWO and EVIL masters who enslave humans. Great Quakes over 8.0+ are RARE, or they were rare events. From 1960 to 1995 there were only 11 in 35 years. www.NUKETERROR.com is a famous Sollog Site.